Back in 2005, 300,000 writers decided to self-publish their books rather than taking the traditional route, rising to over a million people. Since then, that number has dwindled because self-published authors have given up. What happened? If you’re feeling like it won’t ever happen for you, stop for a moment and change your habits. Start greeting everyone you see with a smile. This will build inner-confidence. Think about your God-given talent and take it seriously. You have a gift and should respect that gift with faith. Never brag about anything. People who brag actually lose confidence. Instead, be humble and share your knowledge with others. When speaking to others, or posting your thoughts on Facebook and on blogs, never complain. Focus on how you’re improving and attempting to help others improve as well. If something goes wrong in your life, whether it’s personal or as an author, become more active. Read more that week. Write more. Focus on a different marketing plan. 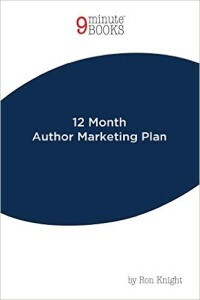 (If you are struggling with marketing, visit 12 Month Author Marketing Plan. When you’re rejected as an author, don’t focus on the rejection but rather focus on the opportunity it provided for you to do something different. Almost always, there was a reason for the rejection that will lead to bigger and better outcomes. These are minor changes in your habits, but have major impacts on boosting your author confidence.